We understand each business has different options and choices thus our software is geared for those needs, we offer very competitive and affordable monthly package to chose from, starting as low as $50 per month or One time software licence to run the application on AST POS Station(s). * Vigore POS is suited for all types of restaurants and general retail with weighing scales, scanners and label printer application. The database is hosted on the POS terminal(s) with option of Cloud services. All orders and employee profile are synced to the Epic POS Pro, Epic POS Lite and Ambient POS. The card reader with the encrypted key set of the preferred payment processor with signup is required to process the credit cards. * Epic POS Pro is an Android based App the apk is available from us and will be soon available on the Google Play Store. It works with the Vigore POS Pro version which has the Mobile POS device integration built into it. If your business requires Mobile devices then the Vigore POS Pro version can support as many devices within the premise. Additional costs may vary from use case. Additional Audiojack card reader from Magtek with encrypted key set of the preferred payment processor with signup is required to process the credit cards. We also have the Ingenico Bluetooth EMV / NFC and Swipe options also to work with Moneris Payments. * Epic POS Lite is a standalone Android App which needs to be synced once the menu and employee profile is created on the cloud server. Once the database is created on the device then WiFi or Internet is not mandatory to take orders, However if payment processing is required then Internet is required to process the credit card since we strongly discourage offline processing of customers cards. Additional Audiojack card reader from Magtek with encrypted key set of the preferred payment processor with signup is required to process the credit cards. * Ambient POS iOS7 App is Free to download from the Apple App store. It works with the Vigore POS Pro version which has the Mobile POS device integration built into it. If your business requires Mobile devices then the Vigore POS Pro version can be upgraded to handle as many devices. Additional costs vary from use case. * Elite Care is our support, database backups, constant software updates program to assist our new and old clients to help them updated with new feature releases and security measures. Affordable monthly plan helps all the merchants be on-board and always UP and running. Yearly Elite care and multi-location discounts are also offered. ** Payment processing is offered with our select certified PCI/PA-DSS processors. Our gateway specialists offer you the most courteous service and offer price match guarantee on several platforms. For, Vigore POS any of the listed processors can be securely integrated to perform flawless operations with maximum up-time and best industry matched rates. Epic tablet POS is built on the latest Google Android technology, it is a perfect order taking companion that works seamlessly with AST Vigore POS and any major brand of the networked EPSON Compatible POS thermal and/or color dot-impact printers and cash drawer. We offer single window solution to entire range of our products and services through our preferred business partners as well. Merchant card service integration with PCI Compliant First Data (Datawire), NAB, FAS, Vantiv, Heartland, OpenEdge (Paypros), Mercury Payment Systems, Moneris and with more Gateway options coming up, soon. Manufacturer patented encrypted Card Readers certified by each merchant service for secured End-to-End Encryption processing for your peace of mind. Network Liquid spill resistant Thermal, Dot impact, Wireless Printers and Bluetooth Printers also available upon request. Cash Drawers, Touch Monitors, Server boxes, Network Switches, Routers and all other types of certified peripherals available on request. Please fill in the information to better understand your requirements. 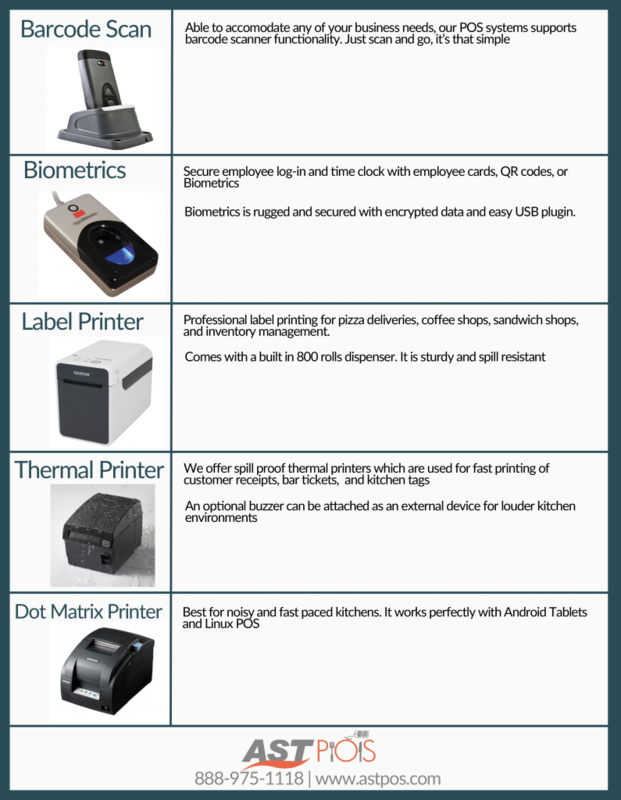 The business partner in your demographics shall contact you soon for the right POS solution for You! Thank you for choosing us. Note: Terms, Conditions and availability apply to the products offered by AST and subjected to change without further notice. All brand names and trademarks are the sole property of their respective owners. All copyrights reserved. Vigore POS is the most affordable solution on the Cloud or on-premise. Vigore POS is fully optimized point-of-sales solutions for all types of restaurants including pizza delivery, diners, bars, food trucks, concession stands and general retail businesses. 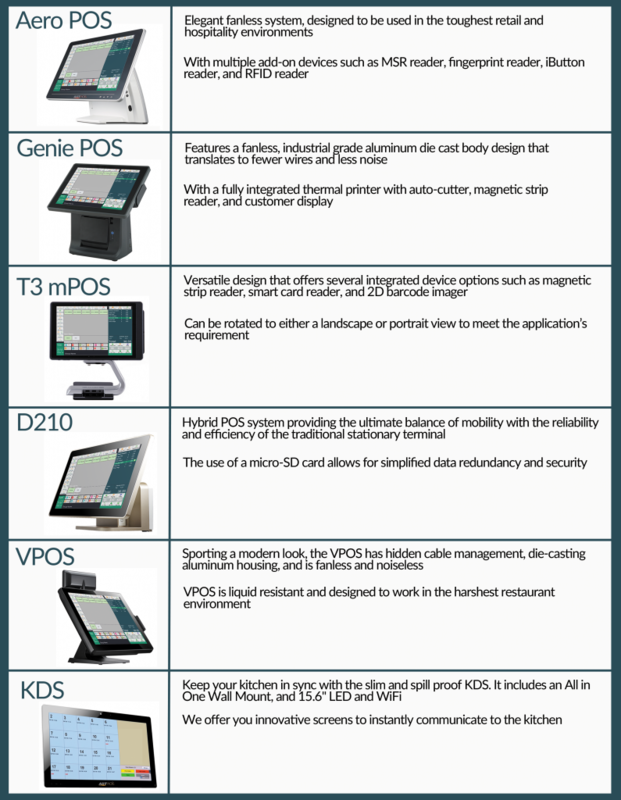 Vigore POS works on Ubuntu Linux or on Windows tablet as a standalone unit. It allows Android and iOS mobile devices integration with our app. Our nation wide installations and decade of industry insight brings you a matured product. Your Control Center. Epic POS Pro is our dedicated app for Android devices. Take Orders on the Tables, Quick Line busting, Drive Through, Take payment on the Go, Make it Social and send Coupons instantly. Optimized for all types of restaurant and general retail businesses. Epic POS Lite works as a standalone app without WiFi. All the menu items are synced from Cloud server. Epic POS suite gives your business greater flexibility and speed. Take your business to the next level. Get on board with Epic POS today. Ambient Online Ordering and Self Ordering KIOSK now available along with Waitlist Management. Seamlessly integrated with our Vigore software, It helps you move lines and tables quickly with the fewest number of mistakes. SMS the Waitlist Customers when the Table gets available Track the customer loyalty, Dining habits, Amount spent... and reward them too, Save big on money with deploying one Suite of Tools to cover the busy operations. Also available "Ambient Reservations" Contact us for details. Aura Analytics: On the Go! Aura Analytics on the Cloud with subscription is optimized for businesses who have multiple locations or need remote access to generate reports. This awesome tool provides you all the data metrics with centralized control. Use a PC or mobile device to login remotely in order to analyze, compare sales data, inventory, expenses and labor reports in real time. This is the perfect tool to help assist management in processing information efficiently. The data can be on-the-Cloud or on-premise POS.